We’d love your help. Let us know what’s wrong with this preview of Dewey by Vicki Myron. De How much of an impact can an animal have? How many lives can one cat touch? How is it possible for an abandoned kitten to transform a small library, save a classic American town, and eventually become famous around the world? You can't even begin to answer those questions until you hear the charming story of Dewey Readmore Books, the beloved library cat of Spencer, Iowa. Dewey's story starts in the worst possible way. Only a few weeks old, on the coldest night of the year, he was stuffed into the returned book slot at the Spencer Public Library. He was found the next working by library director Vicki Myron, a single mother who had survived the loss of her family farm, a breast cancer scare, and an alcoholic husband. Dewey won her heart, and the hearts of the staff, by pulling himself up and hobbling on frostbitten feet to nudge each of hem in a gesture of thanks and love. For the next nineteen years, he never stopped charming the people of Spencer with this enthusiasm, warmth, humility (for a cat), and, above all, his sixth sense about who needed him most. To ask other readers questions about Dewey, please sign up. Is it an intresting book? This answer contains spoilers… (view spoiler)[ I just finished the book and Dewey lives a full life until he is 18. At the age of 18, Vicki gets called back into work because Dewey is acting…more I just finished the book and Dewey lives a full life until he is 18. At the age of 18, Vicki gets called back into work because Dewey is acting strangely. Vicki takes him to the vet, where they discover a tumor in his stomach. His death was very peaceful. This happens in Chapter 26. Wow, am I in the minority with this one. I like cats, I like libraries, and I've even known a library cat or two. I didn't expect to rave about this book quite as much as many others have done, but I also didn't expect to think so very little of it. A few cute anecdotes notwithstanding, there is just nothing special about this book. Any pet owner could write as much (and many would do it markedly better). The tone of the author was grating to me, and her experiences were not nearly as interestin Wow, am I in the minority with this one. I like cats, I like libraries, and I've even known a library cat or two. I didn't expect to rave about this book quite as much as many others have done, but I also didn't expect to think so very little of it. I didn't expect this book to be quality literature and of course it wasn't. It was a feel-good book, only I've noticed that most feel-good books actually make me feel nauseous instead of good. Especially those that idealize small town America. "That's another of Spencer's unique and valuable assets: its people. We are good, solid, hardworking midwesterners. We are I didn't expect this book to be quality literature and of course it wasn't. It was a feel-good book, only I've noticed that most feel-good books actually make me feel nauseous instead of good. Especially those that idealize small town America. "That's another of Spencer's unique and valuable assets: its people. We are good, solid, hardworking midwesterners. We are proud but humble. We don't brag." Sure they don't. I have just read a 275 page long eulogy to Spencer and its people. Try as she might Vicki Myron didn't fool me. Under a heavy sugar coat I could see rotten flesh bubbling with old grudges, grievances and hostilities. I would love to read more about that but I guess it was a no go as the people's real names were used. The book was really chopped (a bit like my review). There were parts about Dewey, bits about Vicky's life, and the history of the town all thrown in together. They didn't blend very well but I was slightly entertained by some chapters so I am giving it two stars. I thought I was reading a book about a cat, but I wound up reading a book about a woman with a lot of troubles in her life. For every chapter that was actually about Dewey, there seemed to be 2 or 3 that were just about her. I'm very sorry for the losses in this woman's life, and the things she went through, but that's not what I set out to read. I expected a good, light-hearted story about a cat, but every time I reached a point where my spirits were lifted, Ms. Myron brought it all crashing do I thought I was reading a book about a cat, but I wound up reading a book about a woman with a lot of troubles in her life. For every chapter that was actually about Dewey, there seemed to be 2 or 3 that were just about her. I'm very sorry for the losses in this woman's life, and the things she went through, but that's not what I set out to read. I expected a good, light-hearted story about a cat, but every time I reached a point where my spirits were lifted, Ms. Myron brought it all crashing down with the next crisis/drama involving herself and her family. There were some very sweet stories about the cat, which pushes it from one star to two. I wish there had been more. I also think it would have been a good idea to include actual testimony about Dewey from people he had touched. Also, some of the articles written about Dewey could have been included instead of the little "notes" recreated. They may have been cute, but honestly, by the time the longer ones were put in there, I wasn't even reading them. There is a common idiomatic phrase, "it does exactly what it says on the tin". Well in the case of Dewey: The small-town library-cat who touched the world by Vicki Myron and Bret Witter, it doesn't. The book is a bit of a hotch-potch. It starts out as a very promising and touching animal story. The librarian of a small town library in Spencer, Iowa, discovers a tiny, frozen, furry bundle in the drop-box of her library. Incredibly, the bundle proves to be a kitten who is still alive, though barel There is a common idiomatic phrase, "it does exactly what it says on the tin". Well in the case of Dewey: The small-town library-cat who touched the world by Vicki Myron and Bret Witter, it doesn't. The book is a bit of a hotch-potch. It starts out as a very promising and touching animal story. The librarian of a small town library in Spencer, Iowa, discovers a tiny, frozen, furry bundle in the drop-box of her library. Incredibly, the bundle proves to be a kitten who is still alive, though barely. Which animal-lover could not fail to be moved by such an opening - especially knowing that it was a true story? The next few chapters describe how the kitten wins everyone's hearts, both staff and public. Sometimes the events are moving, sometimes comical, just as all encounters with domestic animals are in real life. 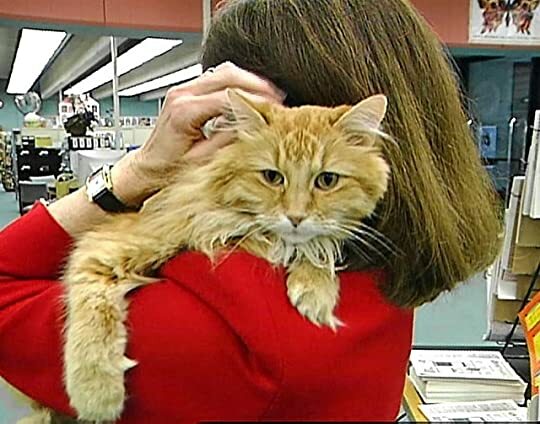 Eventually the long-haired ginger kitten becomes formally adopted as a library cat, and named "Dewey (after the library system) Readmore Books". A charming story. I was looking forward to the rest. Then quite a lot about the town, Spencer,'s history started to intrude. Fair enough though; it put everything in context. Spencer had had a chequered past, with changing farming and industrial needs, the Depression, the recession. Various new developments had been proposed. As a reader I went along with it, wondering when I could chuckle at Dewey's antics again. Chapter 5 was entitled, "Catnip and rubber bands". Ah yes! I knew about those. I settled down happily. Gradually it shifted focus. From the introduction we had learnt a little about Spencer and the state of Iowa. This was useful information, especially for non-American readers. And the book says that even Americans tend to think of Iowa as a "place you fly over on your way to somewhere else." Iowa is predominantly devoted to the farming industry; growing corn, and manufacturing all the by-products of corn, such as corn starch, xanthan gum, ethanol etc. All the additives which 21st century life seems to need. Apparently a startling 70 per cent of the average American diet is corn, in one form or another. But then in addition to all the history, the shift of emphasis to facts and figures about trade and industry, we also begin to get autobiographical information about Vicki Myron; her ancestors, her friends and co-workers, the bigwigs in the town, her current family. So now we have three different components. Searching for bits about the cat Dewey began to feel like searching for gold within the corn of Iowa. Vicki Myron's family certainly had a rough life. They seemed to have more than their fair share of bad luck and poverty, illnesses such as cancer and depression, and alcoholism and suicide. Vicki Myron herself had a troubled marriage, had to fight for the right to have a professional job, to bring up her daughter on her own, to cope with teenage alienation, and to deal with her own chronic ill-health. Many of Spencer's inhabitants suffered, some in similar ways. Life was hard, and continues to be so for many small-town folk. It would be wrong to lessen in any way the courage shown by these individuals, who have to work so hard to survive, and to continue in their community's way of life. The "message" of the book is that Dewey helped. Because they began to care about him, people began to regain their self-respect when they lost their jobs, or when times were tough and the future looked bleak. They began to smile more, and to fight to survive. There are stories about disabled children, or children who would never speak - until they met Dewey. Dewey brought people together, and made the library a focus for the community. And there are stories of visiting families from all over the world, as the fame of this little cat grew, of articles published in magazines, and even a small slot in a Japanese film. "This is the heart-warming and unforgettable story of a truly idiosyncratic cat with a strong sense of loyalty and love, and a taste for fast-food". There is just too much history of Iowa, too much ethnography, and far too much biography and autobiography, however admirable these people are. Perhaps it would interest some readers in itself, but it is of only limited interest in a book supposedly about a cat. "a full-time professional writer who specializes in contemporary nonfiction, usually working with a co-author to tell their inspiring true story"
"Is that what Iowa is all about? Maybe the heartland isn't just the place in the middle of the country; maybe it's also the place in the middle of your chest." This reader has a sneaky suspicion that the "saviour" side of Dewey is overly stressed to fit the role he is cast in to save this small town and its people. I've no doubt he was popular, and all cats have their unique special abilities, but "touched the world"? There are sequels too, which is probably primarily a business decision. The material here about Dewey would have been better presented as a short book - and been far more entertaining too. My local library also has a cat. I almost fell over him one morning when I went through the main door; he was lapping at a saucer of milk. Sometimes I find him asleep in the children's section, next to the radiator. He's also a ginger cat, similar to Dewey. This book is worth buying for the cover alone, which has a beautiful picture of Dewey in his prime. I love cats, and reading about animals, providing the book is not overly twee. Vicky Myron's "Dewey" is a book about many things: life in small town Iowa, Vicky's own life history, the important role a library can play in the life and identity of a community and, of course, Dewey Readmore Books, one of the best known and well loved cats in the world. Despite the variety of topics Myron writes about, her book holds together so well through her decision to write honestly about everything. Some of her personal and family history was obviously difficult to write about, but its Vicky Myron's "Dewey" is a book about many things: life in small town Iowa, Vicky's own life history, the important role a library can play in the life and identity of a community and, of course, Dewey Readmore Books, one of the best known and well loved cats in the world. Despite the variety of topics Myron writes about, her book holds together so well through her decision to write honestly about everything. Some of her personal and family history was obviously difficult to write about, but its her willingness to do so that makes this book much more than a simple book about a library cat. Dewey was, of course, the catalyst (catalyst) for writing the book and his story is a great one. His adventures as a library cat make for entertaining reading and any cat lover will appreciate Dewey's spirit and personality. Even more, cat lovers will nod knowingly as they read about the strong emotional bond Dewey has with those closest to him. While Myron was Dewey's "mom", she also has the wisdom and the insight to understand the impact one special cat can have on individual lives as well as an entire community. She also does a fine job honoring and respecting that one special cat and the impact he had on her life. A little disappointing. I was expecting a book about Dewey but he hardly featured at all. I enjoyed the sections about the other cats but again they were out weighed by long anecdotes about their owners which did not really interest me. The best bits are the photos especially the one of Dewey on the cover. He was a real beauty. A non-fiction book about an adorable cat and a small town's history. The cat helps change that history and give the town's heart a bit more beat. Until they acted like asses at the end of his life and started taking that for granted (typical people!) It really comes across as an almost miraculous story when the little bundle of kitten was discovered in the mail slot like discarded trash. I'm sure the librarians never imagined how popular the cat would eventually become and how much it would affect the life of the librarian, Vicki. While some of the town lore was interesting, I admit to skimming some of it. The fun antics of Dewey captivated me - I'm a cat lover myself so could relate to some of the chilling spots, box obsessions and personality quirks, but there were new cat weirdness situations that was new to me. For example, Dewey LOVES rubber bands, so much so that they had to keep them under lock and key. The cat's adorable, and if you ever wanted to know how a cat would adapt to living in a library, here you go. Cats and books go together, right? It's not just a long book about staring at a cat, but how Dewey changed the lives of several with their own histories. When Dewey started becoming one of the furry famous, the stories of interviews and different cat food commercials were more interesting that you'd think judging off description alone. Sweet stories overload - There's a tragically handicapped girl who smiled for the first time in years with Dewey's attention, people not wanting to disturb the cards because Dewey was laying in the box, people coming across the country in family trips to find the legendary cat. Dewey' doesn't just dish out the sweet stuff, though - it talks about the naysayers, the political library committees (grrr), and of course how people were less accepting of the cat who had done so much for the town with revenue and aid when he gets older and less pleasingly fuzzy. The ending is, of course, sad. I knew what was coming so that softened the blow, but I was surprised (and touched) with how much Vicki was affected for life. I won't spoil the ending with how she changes her life in a huge way, but it adds a sense of loyalty and charm to a book that was already unique and special. Besides being a treat for cat lovers, it digs into the details of how special libraries are and how much they offer patrons, especially in small towns that struggle. Through economic woes, factory shut-downs, numerous changes, the librarian and Dewey stuck around to do what they could in the small amount of time life allotted them. After reading the stories of Dewey and all his little habits, Vicki's life and her struggles with her daughter and cancer, I came to really feel like I knew both of them in a way. That's one of the best things a non-fiction book can do for a person, be authentic enough to give that personal connection. Read it for the cat, read it for the memories of the small town in Iowa, read it for the library ambience - it's worth a look even if it's just for the adorable pictures that grace the chapter headings. Firstly, thank you all for enjoying putting up with my cat-story updates. As pet lovers know, we all need to talk about our pets to random strangers from time to time, so that was rather therapeutic. Dewey's story is an incredible one. And, as shown by the 20-year difference from the beginning to the end of the book, it's highly unlikely the library would have adopted a cat in this day and age. As Vicki notes, there were complaints after Dewey showed up and it was decided that he would stay, but Firstly, thank you all for enjoying putting up with my cat-story updates. As pet lovers know, we all need to talk about our pets to random strangers from time to time, so that was rather therapeutic. Dewey's story is an incredible one. And, as shown by the 20-year difference from the beginning to the end of the book, it's highly unlikely the library would have adopted a cat in this day and age. As Vicki notes, there were complaints after Dewey showed up and it was decided that he would stay, but they appeared to be few and far between. Nowadays it would probably be unheard of because of the sheer number of people with allergies and the like. But I'm glad for Dewey and the Spencer library; glad this was able to happen and that Dewey was able to help so many people in his way, as animals do. I'm not sure why, but cats and books have always seemed to go hand-in-hand to me (I've got a photo blog basically dedicated to it), and this story was so sweet. I really found myself relating to Vicki even when she went off on tangents about the town's history or her family; I grew up in a small town, and my corner of Ohio is often surrounded by cornfields as much as her spot in Iowa seems to be, once you get out of the city a little way. Vicki's library stories also make me so thankful for the little branch library I had available when I was in school; by the time I was in high school, the branch library had been relocated and plopped square between the middle school and high school buildings and was adjoined to them via the high school library, so if the school library didn't have something I could pop through the door to the branch and be right back to school again in a minute. Now, here in Akron, we have branches all over the place and several of those Little Free Library spots, but I'm enormously spoiled by the main library. I can just imagine trying to have a library cat there -- poor thing would probably get lost and we wouldn't see him for days! But Dewey seems to have been a perfect fit for that little library in Iowa. While this is not a great literary book, I give it high rating because it touched my heart and is such a strong reminder of how much animals add to our lives. If you have ever saved or rescued an animal, you know how grateful they are and how much love they give back. They bring us though hard and sad times in such a special way. This little guy touch the hearts and lives of an entire town and, through this book, continues to touch hearts. This was an okay book - not great, but pretty interesting and easy to follow. It was an interesting (and sometimes bizarre) mix of emotions; happy, sad, or even disturbing. - 30% of this book is about the cat. If you expect to have a book just about the cat, you will be very disappointed. - 30% is about small town America, 80s farm crisis, etc. This was sort of interesting, but unexpected. - 30% is about the author's difficult life. She went through a lot, This was an okay book - not great, but pretty interesting and easy to follow. It was an interesting (and sometimes bizarre) mix of emotions; happy, sad, or even disturbing. - 30% is about the author's difficult life. She went through a lot, and I almost felt like writing this book must have been therapy for her to get things off her chest. It seemed like every few pages something else bad was happening to her - I felt bad for her! Ignore the "to-read" following "never-got-to-the-last-page." Only 210 more pages to go the distance and earn the right to give one star to DEWEY -- but I left the ring. Another ten pages -- and I might have been "down for the count" in Spencer, Iowa. Sorry -- kitty lovers. By the way, I'm one of you. Sorry -- Simple Simon lovers. And sorry -- small-town, out-in-the-middle-of-nowhere, lovers. This book may be for you, but it's not for me. When I hated grading freshman compositions, but before the Ignore the "to-read" following "never-got-to-the-last-page." Only 210 more pages to go the distance and earn the right to give one star to DEWEY -- but I left the ring. Another ten pages -- and I might have been "down for the count" in Spencer, Iowa. Sorry -- kitty lovers. By the way, I'm one of you. Sorry -- Simple Simon lovers. And sorry -- small-town, out-in-the-middle-of-nowhere, lovers. This book may be for you, but it's not for me. When I hated grading freshman compositions, but before they started giving me chest pains (diagnosed as unexpressed anger), a friend showed me Richard Armour's "Lines Long After Pope, By a Reader of Freshman Themes." These few lines drove thirty-two years (not as long as a quick trip to Iowa seemed to take) from subconscious to conscious territory so that, by Chapter 7 of DEWEY, I could mumble: "Small wit is theirs,/ in shopworn phrases dressed,/ what oft was thought/ and twice as well expressed." I had been told that I would love DEWEY. Because I love cats??? I didn't need more reasons to believe that it's good to expect nothing and be grateful for anything acceptable, but I now have something else to confirm that belief. If, as Alexander Pope proposed, "True Wit is Nature to advantage dressed,/ What oft was thought, but ne'er so well expressed" ("An Essay on Criticism" II.297-98), Vicki Myron (with Bret Witter) deserves the Half-Wit Award for getting the part about dressing up Nature. With characters making comments such as "Where there's a will, there's a way"(45),though, you think, "Richard Armour, your freshmen graduated and went on to write DEWEY: THE SMALL-TOWN CAT WHO TOUCHED THE WORLD. Granted, I may have missed the best parts of this book; but until my cats stop sitting on books and decide to learn to read, I don't expect to find out if I have indeed ignored choice morsels in the litter box. BLURB: How much of an impact can an animal have? How many lives can one cat touch? How is it possible for an abandoned kitten to transform a small library, save a classic American town, and eventually become famous around the world? You can't even begin to answer those questions until you hear the charming story of Dewey Readmore Books, the beloved library cat of Spencer, Iowa. 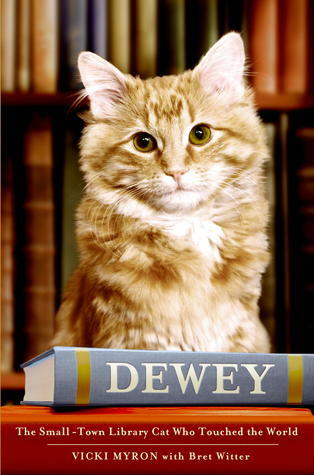 Jawelnofine, I am one of those weirdos who just cannot resist the idea of Dewey the library cat. My whole life w BLURB: How much of an impact can an animal have? How many lives can one cat touch? How is it possible for an abandoned kitten to transform a small library, save a classic American town, and eventually become famous around the world? You can't even begin to answer those questions until you hear the charming story of Dewey Readmore Books, the beloved library cat of Spencer, Iowa. So yes, this is sooooooo my kind of book. I am in love with Dewey. Period. Recommends it for: People who like reading fluff. Purely a feel-good story (which can be a good thing or a bad thing, depending on what you like to read). I can't help but feel the author was prone to over-romanticize Dewey and attribute absolute intent all of the time to all of his actions. Don't get me wrong--I am a cat owner/lover myself... But, as a resident realist, the fact that Dewey lived so long, generated so much publicity, and obviously soothed a lonely woman who seemed to have a host of physical (and possibly emotional?) issues may Purely a feel-good story (which can be a good thing or a bad thing, depending on what you like to read). I can't help but feel the author was prone to over-romanticize Dewey and attribute absolute intent all of the time to all of his actions. Don't get me wrong--I am a cat owner/lover myself... But, as a resident realist, the fact that Dewey lived so long, generated so much publicity, and obviously soothed a lonely woman who seemed to have a host of physical (and possibly emotional?) issues may have created a greater-than-God cat in the author's mind. Perhaps he was Saint Dewey--and a miracle--for Vicki... But my critical nature keeps me coming back to the fact that we was, in fact, just a cat. He arrived in a library chute on a bitterly frigid January morning. He was a cute and clever cat. And he made many friends along the way "dew" to his pleasant personality. All of these make for a wonderful story. And yes, I cried at the (predictable) ending. But the whole story was told in an almost too-saccharin-y way, for me. Good for a light, heart-warming read, but that's about it. An unforgettable story about a cat and his power to change our lives forever!! As I walked out of Penn Station this morning, the proverbial country mouse blinking in the early morning city sunshine, the homesick hole in my heart was filled with a glorious and familiar sight--Borders Bookstore! Oh thank god, finally somewhere I can navigate with familiar ease. And familiarity is an understatement. Every table and shelf looked exactly the same as every table and shelf in the bookstore back home--Cormac McCarthy alongside Love in the Time of Cholera. Jane Green sidling up to As I walked out of Penn Station this morning, the proverbial country mouse blinking in the early morning city sunshine, the homesick hole in my heart was filled with a glorious and familiar sight--Borders Bookstore! Oh thank god, finally somewhere I can navigate with familiar ease. And familiarity is an understatement. Every table and shelf looked exactly the same as every table and shelf in the bookstore back home--Cormac McCarthy alongside Love in the Time of Cholera. Jane Green sidling up to Jodi Picoult. And over there, wouldn't you know it? An entire tower dedicated to the Twilight series and associated chachkis. Yep, Borders is ironically unbound by American geography. This book is a 2.75 rating for me but I'll round to a 3 as I couldn't have finished this book if it wasn't in an audio version. I'd definitely recommend the audio over print. When I bought this book I thought I was buying a book just about Dewy Readsmore Books, his life at the library, and aspects of how he grew to be the most famous library cat ever. Instead I heard a lot about the private life of his owner, Vicki Myron, and the town both cat and owner call home. This disappointed me as, if I'm This book is a 2.75 rating for me but I'll round to a 3 as I couldn't have finished this book if it wasn't in an audio version. I'd definitely recommend the audio over print. When I bought this book I thought I was buying a book just about Dewy Readsmore Books, his life at the library, and aspects of how he grew to be the most famous library cat ever. Instead I heard a lot about the private life of his owner, Vicki Myron, and the town both cat and owner call home. This disappointed me as, if I'm honest I didn't really care about anything not having to do with Dewey. The writing in this book is fine and simple overall. The narrator does a decent job but can be boring at times. There seemed to be a lack of emotion in her voice. I found myself bored with this audiobook and even thought about not finishing it multiple times. If this was the print version I wouldn't have made it as far as I did. This isn't necessarily a bad book but I didn't like it, which surprised me as I usually enjoy stories like this. I just wanted a book about Dewey, not his owner's memoir or his hometown's history. I feel bad for rating this book the way I have but had to be honest in my feelings. This book is certainly a tear-jerker, and one that will appeal to anyone who has a heart, but especially to anyone who works at a library. The book is one of those wonderful experiences where the story may be about a cat, but there are lessons to be learned throughout that can apply to anyone's life. But the main character is, of course, Dewey himself, who springs to life in such endearing ways. I never tired of hearing about the behavior and antics of this amazing library cat. My only complaint, This book is certainly a tear-jerker, and one that will appeal to anyone who has a heart, but especially to anyone who works at a library. The book is one of those wonderful experiences where the story may be about a cat, but there are lessons to be learned throughout that can apply to anyone's life. My only complaint, and the only thing that makes this 4 and not 5 stars, was that the writing style was frustrating in spots. Specifically, the person transcribing what Vicki said seemed to plan to return to certain topics, and then never did. There were several points at which the phrasing led you to believe that something would happen and it didn't. Things like (this isn't in the book, just an example of the sort of thing I mean) "Little did I know that this would just be the beginning..." followed by no elaboration on the topic. At first it was just a little distracting, but by the end it got annoying. The flow just seemed a bit random. OMG I AM O.D'ing ON RURAL CHARM GET TO THE POINT ALREADY. I am listening to the audiobook, which is narrated by the same woman who narrated five gruesome mystery novels by Julia Spencer-Fleming. So, even though this book is about a pwecious widdle kitty cat, I keep thinking that any minute there will be a disembowelment. I really don't know if I can finish this thing. It seems to be a Reader's Digest article that has metastasized into a bestseller. UP OMG I AM O.D'ing ON RURAL CHARM GET TO THE POINT ALREADY. Случвало ли ви се е да прочетете една и съща книга повече от веднъж и да се просълзявате при всяко нейно прочитане? На мен ми се е случвало с не повече от три-четири книги. И тази се оказа една от тях. Имам много истории с любимите си книги. Историята ми с "Дюи" започна доста отдавна - когато видях книгата на книжния панаир във Франкфурт. Пожелах я още тогава, но тя не можа да стане моя. Това стана няколко месеца по-късно, която я открих в книжарница от веригата "Уотърстоунс" в Англия. Прочетох я и Случвало ли ви се е да прочетете една и съща книга повече от веднъж и да се просълзявате при всяко нейно прочитане? Прочетох я и се влюбих. Аз съм коткофен. Израсла съм с котки. Имам "два броя" вкъщи. Но дори да не беше така, дори човек да не е подозирал, че може да изпитва топли чувства към котка, Дюи, библиотечният котарак от градчето Спенсър в Айова, е котка, в която няма как да не се влюбиш. Изразът "топла история", използван за описание на книга, вече почти се е превърнал в клише, но тази книга е точно такава. Тя е пропита с топлота и любов. И за пореден път показва, че никое живо същество не е "просто" котка, "просто" куче или каквото и да е. То е уникално, само по себе си. И само трябва да попадне на точното място, в точния момент, при точния човек, за да се разкрие тази уникалност. "Дюи" не е просто историята на един риж котарак. Нито е само историята на една библиотека. В тази малка книга е събрано толкова много - лична история, историята на едно малко градче, от онези, които едва можете да намерите на картата, но които упорито водят своята борба за съществуване и отстояват правото си на смислен живот. И, разбира се, историята на Дюи. На малкото рижо котенце, което се превръща в символ и любимец на един цял град, а после печели още милиони сърца по света. Без да е извършило велики дела. Без да е герой. Просто с това, че съществува - и дава обич на всички, които срещне. А в отплата иска само едно: да бъде обичано. "Дюи" в никакъв случай не е сълзлива и сантиментална книга. Тя е просто истинска. Наред с веселите и забавни "котешки моменти" има и тъжни мигове, има болезнена реалност, има тъга и загуба. Историята в никакъв случай не е само в розови краски. Но няма нищо прекалено, нищо пресилено, няма излишен драматизъм. Вики Майрън просто разказва. За себе си, за любимите си хора, за Дюи. И именно този начин на разказване печели читателите. Човек няма как да не се засмее на "Режимът на Дюи" или на "Правилата на Дюи", или на "Работната характеристика на Дюи". И няма как да не се просълзи в края на книгата. This book is in some serious need of editing. The anecdotes about Dewey were cute, but the long winded history of small town Iowa and the author were too much for me. I didn't finish this book and I wish I had the two hours back that I gave to it. Не знам как се очаква да оцениш нечия истинска история с брой звезди. Нечии премеждия, надежди, обич, загуби и тъгуване - как да им сложиш оценка, като че е поредният художествен роман? На такива хора като мен не трябва да им е разрешено да се докосват до книги като Дюи. Не си спомням кога за последно съм плакала на книга, но този път ще го запомня, защото тук не говорим за отронването на една или две сълзи. Дюи (котаракът, не само книгата) е бил топлина и обич, утеха и близост, каквато може да из Не знам как се очаква да оцениш нечия истинска история с брой звезди. Нечии премеждия, надежди, обич, загуби и тъгуване - как да им сложиш оценка, като че е поредният художествен роман? Oh, this made me laugh and feel sad at the same time. Having emptied book drops myself, Vicki Myron sure knows how it goes. Nothing surprises me. But Dewey's tale in Spencer, Iowa sure was something. With human reversals and our sad good-byes, nothing seems to unite as does a savvy beast who understands how to run all of us. Dewey's legacy, IMHO, is trying to focus on every day kindness to closest and stranger alike, and toward achieving a uniting factor of non-criticism toward the most peaceful Oh, this made me laugh and feel sad at the same time. Having emptied book drops myself, Vicki Myron sure knows how it goes. Nothing surprises me. This book turned out to be about more than a cute cat. I also learned a lot about corn, family farms, farming and small towns, as well as about the author. She tries to stay out of the book, but that is a difficult task. Dewey is an amazing cat and definatley worth reading about. I’m a lark. At 5.00am in the morning I can read anything. In fact I’m up for a challenge. But as the day wears on I flag. Come 11pm at night my brain is mush, and my bedtime reading has to be easy, soothing and happy. Stodge for the eyes. It has to go down like my favourite pudding. “Dewey – The small-town library-cat who touched the world” was in this vein. It should have appealed to bedtime me – I am completely besotted with cats, and with libraries for that matter..... but it didn’t. The book I’m a lark. At 5.00am in the morning I can read anything. In fact I’m up for a challenge. But as the day wears on I flag. Come 11pm at night my brain is mush, and my bedtime reading has to be easy, soothing and happy. Stodge for the eyes. It has to go down like my favourite pudding. I was also let down in that Dewey the cat didn’t really come alive for me. There were several occasions where I could have found myself dabbing my eyes with tissues and aww-ing at Dewey’s adorableness, but this didn’t happen. Instead we were given lots of statistics to prove his lovability (e.g. when people were asked to choose a name for him, hundreds responded, and when he died the librarian received more than a thousand emails conveying sympathy), but this was proof from the outside. I wanted proof in my heart, and it never happened. I never experienced Dewey’s wonderfulness for myself. Judging by the statistics, and descriptions of Dewey’s behaviour, he really was a very exceptional cat, loved by many people…but I never really felt it for myself. I feel a mean and horrible person for not liking this book more. 25,689 people have rated it here at Goodreads (now that is a phenomenal number of people!) with an average rating of 3.77.... but it just didn’t turn me on. Отдавна имах нужда да прочета подобна книга, която да ми напомни, че най-обикновените неща всъщност са най-необикновени. Колко е важно да обичаш безрезервно и без очаквания. Колко е важно да се държим мило с всички, защото не знаем през какви трудности е трябвало да преминат и колко болка са изпитали. Дюи - макар и на пръв поглед просто едно красиво коте - е наистина много повече от "просто коте". Той е олицетворение на онзи чист детски дух, който ние всички трябва да се стремим да запазим. Препоръчвам много горещо. Няма да съжалявате. Тази книга е любов и да й направя ревю ще е много трудно. Любителите на котки очакват да е посветена само и единствено на Дюи, а другите биха я погледнали с насмешка, защото смятат, че не биха открили нещо повече от историята на една котка в нея, но… „Дюи – котето от малката провинциална библиотека, което трогна света“ е много повече от историята на една котка и точно това ще се опитам да ви покажа с това ревю. This book is as much about Spencer, Iowa and the people who live there as it is about Dewey the cat. The author (a librarian in Spencer) tells of the people in the town and how Dewey affected their lives for the better. She chronicles his life from when he came to the library as an abandoned kitten to his death at age 19. While heartwarming, this isn't a cutsie story about a kitty cat. The town, the librarian, and the cat are all survivors of hard times. An enjoyable read. I was born in Spencer and grew up on a farm south of Moneta, Iowa—a town that no longer exists. I graduated from Hartley Iowa High School and moved to Mankato, Minnesota where I worked, married, had a daughter and went to college. I have a bachelor’s degree from Mankato State and a master’s from Emporia State University, Emporia, Kansas. In 1982, I returned to Spencer, Iowa to begin working at the I was born in Spencer and grew up on a farm south of Moneta, Iowa—a town that no longer exists. I graduated from Hartley Iowa High School and moved to Mankato, Minnesota where I worked, married, had a daughter and went to college. I have a bachelor’s degree from Mankato State and a master’s from Emporia State University, Emporia, Kansas. In 1982, I returned to Spencer, Iowa to begin working at the public library. In 1987, I was named Director of Spencer Public Library and I served in that position for 25 and ½ years. I retired in 2007 to write this book. I currently reside in Spencer.